Sky Lake Golf Club situated at the Van Son Lake area, Chuong My District, Ha Noi (40km from Ha Noi center). Sky Lake Golf Club is the first part of the Eco-Tourism Complex in the countryside of Ha Noi, the naturally hilly area combine with Van Son Lake to form impressive scenery. The designers did a terrific job when they salvaged the natural charm of topography, saved all small waterfalls, high mounds, big trees to build a modern and pristine golf course that looks like a small version of the nature of Vietnam. The 36-hole golf course spans across 200 hectares, and is divided into two great 18-hole PGA-standard courses: Lake Course and Sky Course. The members-only Lake Course to the West spreads out in a wide area around the lake and the mountainous region. Playing golf in such splendid natural surroundings will make you want to play over and over again. Besides, Lake Course presents a real challenge for even the most experienced golfers. 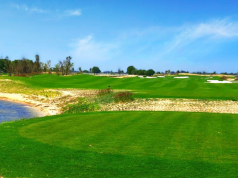 The golf course is holding the title of Vietnam’s longest golf course at a 7,887 yards length, it was also voted the 2012/2013 Most Challenging Course in Vietnam by the Vietnam Golf Association. The public access Sky Course to the East stretch out to 7311 yards from the gold tee and is surrounded by large natural Vietnamese forests and lead to the wide open skies. Sky Course offers an opportunity to enjoy the sport regardless of your level of play. Although not really tough as its “older brother” – Lake Course, it’s not easy to conquer 18 holes of Sky Course. According to Mr Ahn Moon Hwan, the course’s architect, each hole on Sky Course has its own very different gradient with hidden risks, golfers have to spend a particular amount of time learning about the design of the course, apply advanced golf skills and use the imagination to be able to get a high score. Besides, with the purpose of helping golfers comfortably plan their tactics, 18 holes of Sky Course are designed with totally different scenery. Each hole has its own kind of flower. But if you are a professional golfer with nonstop burning passion for the game of golf, you can be very eager when you are on the 15th hole where named Dien Bien Phu (the most important battle in the French Indochina War) due to its breathtaking and difficult topography. The typical par 4 hole 400 yards is the hole where the architect spent a great deal of time for it. The Sky Course’s most challenging hole might be the highest peak on your way to be the winner. 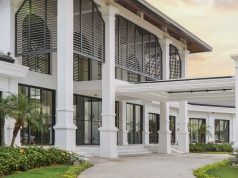 The world-class Club House is the meeting place for members and guests, Lake and Sky, and includes: luxury Spa rooms, banquet room, well -stocked golf shop with all your golfing needs, bar, the most hi-tech driving range and a golf teaching area. And if you don’t want to come back to Ha Noi late in the afternoon, the 5-star hotel, private villas directly overlooking the course and the Sky restaurant offering a great selection of Asian and Western cuisine will be the perfect “nineteenth hole” for you after a great day of golf. Address: Van Son Commune, Chuong My Dist, Hanoi, Vietnam. The no.2 photo – with a rainbow is so amazing, I love it!